Contractor Supply Caddy A 2 Sided Contractor Caddy in Plastic. Carry all your supplies from place to place. Has a tall rounded ergonomic handle with 3 compartments. 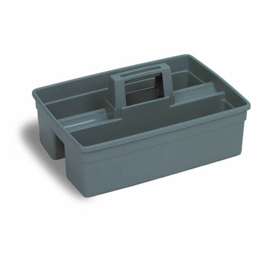 Made of high-density polyethylene, and this carrier fits most janitor carts. Deep compartments prevent bottles and aerosols from spilling. Holds 32 oz. bottles, 16" x 10" x 7"